Elbrus Ski Descent-Adventure skiing Russian style! The Elbrus region has long history of alpine and ski activity but politics have kept it from experiencing the crowds the Alps have. The lift system offers some of the biggest vertical in the world with ski descents of 1700m right off the tram! The great snow conditions due to the higher altitude and colder weather, combine with the many side valleys and mountains accessible just a short tour above the top of the lift stations of Cheget and Elbrus. When done in summer a descent of the summit of the roof of Europe becomes the prize! With the ability to combine lift accessed alpine terrain, tour to a remote hut or take a ride in a helicopter, this region is the logical follow up for those who have been to La Grave or Chamonix and are ready for the next step. 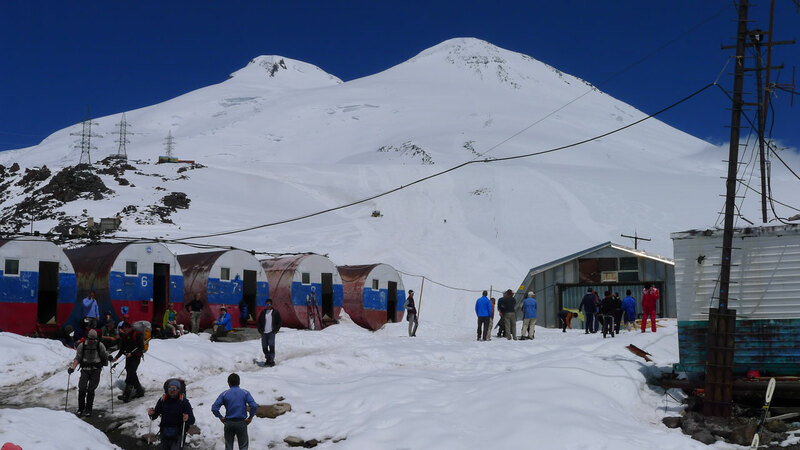 Included: Ground transportation, all meals while on the mountain, tents, stoves, cook kits, group climbing equipment, and guide services- Group transport; Food and accommodation; Russian entry visa support. Not Included: Airfare, transportation within Seattle, gratuities for guides, Personal insurance; Individual transfers; Visa consulate fees, all personal items International airport transfers, Russian entry visa fee. Day 6. Move to the Leap Russia or privately owned mountain huts where we lodge at about 3,800 meters. We use the tram and ski lift to help move our gear. . Overnight at hut. Day 9-10.Drive to Mineralnye Vody. Flight to Moscow, move to the international airport for the return flight home. Day 4. Ski Cheget. The more energetic may wish to ascent Cheget Karabashi 3400m or ski using the Cheget chairlift system. Days 5-8. 4 days of off-piste skiing. It is possible for the group to pay for heli time at an additional cost. Day 8. Drive to Mineralnye Vody. Flight to Moscow, move to the international airport for the return flight home. Drive to Adyrsu valley. “Ullu-Tau” Camp. Night at a lodge (2350m). Chotchat summit (3400m), 4 hours. Koiavgan Pass (3572m), 4 hours. Garvash Pass (3710m), 5-6 hours. Mestia Pass (3860m) and continue to the Mestia summit (4230m), 8 hours. Adylsu Pass (3300m) and continue to the Lokomotiv summit (3750m), 6 hours. Jalavchat Glacier to the Druzhba summit (3650 m), 4 hours. Gumachi Pass (3582m), 5-6 hours. Descent via Jankuat Glacier to the Adylsu valley. Drive by bus to Terskol (Baksan valley). Hotel in Terskol (2100m). Skis or snowboard.Skis should be equipped with alpine touring bindings or telemark bindings. We prefer split decision snowboards w/ skins because you do not need snow shoes. 1 Hard shell jacket with hood Waterproof and breathable. roomy enough to fit over multiple layers. Sleeping bag Rated to at least 20º F. Line the stuff sack w/ plastic bag. Personal first aid kit Basics: moleskin/blister kit, Band-Aids, first-aid tape, ibuprofen, personal medications, etc. Toiletry kit Be sure to include toilet paper stored in a plastic bag. WILL MY GUIDE (OR GUIDES) BE? You will receive an introductory email with the instructor for your course. We are small company who enjoy working together in the mountains as well as highly skilled professionals who hold current Wilderness First Responder certification and are proficient in technical rescue and evacuation skills. Our guides are dedicated to the world of alpinism, many having first ascents and hold professional certifications with AIARE & AMGA. The AMGA is part of the IFMGA, which is the international body of certified mountain guides. HOW MUCH SHOULD I TIP MY GUIDES? Tipping is considered standard practice in the guiding industry. Tipping amounts vary – so $15-20 per day per person/per guide is average that works well for the guides without a serious blow to your wallet. Often 10% of the course cost is a good rule-of-thumb. If you feel that the program was exceptional or substandard the tip can reflect that. CAN I RENT EQUIPMENT FROM BCAG? Yes, we rent Beacons, Shovels, Probes and Packs here. If you need these plus touring equipment, Second Ascent rents avalanche safety equipment, alpine touring, tele and split boards click here. Quantities are limited so please contact us as soon as possible if you are interested. You will carry 15-20 pounds, which will include everything on the equipment list. WHEN DO I NEED TO PAY THE BALANCE OF MY TRIP? Payable when you make your reservation by e-check, or credit card. WHAT HAPPENS IF I NEED TO CANCEL MY TRIP? WHAT HAPPENS IF I WANT TO CHANGE THE DATES OF MY TRIP? Schedule changes are subject to a $50 fee per person up to 2 weeks out and $100 less then 14 days from the start of the trip and may not be possible. If conditions or circumstances preclude running a scheduled program we reserve the right to make the decision as to whether the program will be canceled, rescheduled, or an alternative provided. WHAT HAPPENS IF BC ADVENTURE GUIDES HAS TO CANCEL MY TRIP? In the rare circumstance where we need to cancel a program you can reschedule without a fee or receive a refund on your deposit. If circumstances arise that force us to cancel a program that is already in progress we reserve the right to decide whether a refund or credit, at a prorated rate, will be issued. We are not responsible for cancellation fees or costs arising from your changed or cancelled flights, lodging, or other arrangements. We strongly recommend obtaining trip cancellation insurance from your travel agent. BCAG highly encourages the purchasing of trip cancellation and travel insurance on domestic trips and requires it on International trips. Europeans and Canadians use it because travel insurance provides coverage for trip cancellation and interruption, travel delays, loss of baggage and travel documents, baggage delays, medical expenses and emergency assistance. Several options include Travelex or Travel Guard International at (1-877-248-8992) & www.travelguard.com for protecting your investment, however there are many companies to choose from and you may wish to do some individual research regarding which policy is right for you. WHEN SHOULD I PLAN TO LEAVE A RETURN HOME? We often get this question because most people need to know how much total time they need to take off work. Our Itinerary includes travel days.